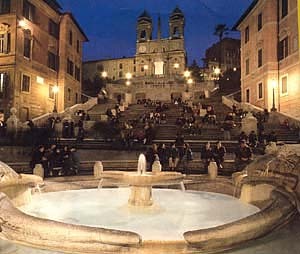 It was May 1989, thirteen years ago, and a small group of pilgrims stood at the bottom of the Spanish Steps in Rome. It was a hot afternoon, right after lunch, “siesta” time when no Roman with any sense would be found traipsing the streets sightseeing. Italians have the very Catholic custom of taking naps after the midday meal. One lady in our group was insisting that we climb that mountain of stairs to see the beautiful fresco of Mater Admirabilis which is housed at the top in the Trinita dei Monti, a convent of the Religious of the Sacred Heart. And so we climbed. The little nun who ushered us in took us straight to the small convent chapel. My first impression was astonishment at the great number of beautiful ex voto silver hearts that lined the walls, almost one on top of another. (An ex voto is an offering made by a petitioner to fulfil a promise or as a token of gratitude for favors and miracles granted, another most excellent Catholic custom). Then my attention turned to an image of a serene and gracious young woman wearing a soft rose dress and ivory veil. 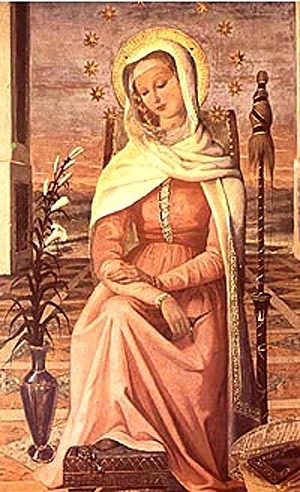 She was seated on a simple wooden chair between a distaff and a lily in a vase placed on the floor. In her hand, folded in a meditative calm on her knee, she held a spinning spindle. At the side of her footstool rested a basket of books. Twelve gold stars elegantly encircled her slightly bowed head. I was taken aback. I had never seen a portrait of Our Lady like this, portrayed as “working” – spinning, and at the same time, in calm meditation. Here before me was a model of Our Lady I had never considered before: Our Lady showing us the perfect balance of work and prayer, an archetype par excellence for young girls and women who live in the world, not in Carmelite convents. Our Lady spins – and prays. One is not neglected for the other. Her meditative spirit makes her work itself a prayer. What also impresses the viewer is her great serenity. Her eyes are lowered, her soft lips are composed and set. Her gravity of bearing is the opposite of what the Revolution presents as an ideal for today’s modern woman, who is trained to celebrate spontaneity, action, and levity of spirit. Her gravity indicates a mentality and way of being habitually turned toward high thoughts. We can have the wrong idea of gravity as something oppressive or sad. True Catholic gravity, like the kind the Virgin Mary displays in this fresco, confers serenity. Such a person is not the prisoner of her moods, but her sensibilities are in perfect harmony with her will. She has an ordered way of being, thinking, and acting. If something unexpected happens, she already has all the interior resources ready to face it, analyze it, and act in face of it. She has a repose that is not nervous or anxious. Here, in this simple picture, one realizes that the Wise and Immaculate Heart of Mary is an abyss of serene gravity. The kind Italian nun, still wearing a habit, was more than happy to relate the story of the miraculous fresco. In 1844, a young French novice, Pauline Perdrau, received permission from the Mother Superior to paint Our Lady in a niche located in a corridor that opened on the cloister. Now, Pauline was a very determined, but a “not so good” painter, the sister explained to us, and she had never done a fresco before. So even after spending hours every day for months on the image, the completed work was also “not so good.” In fact, it was so ugly that the Mother Superior hid it from sight by covering it with a curtain. Two years later, on October 20, 1846, Pope Pius IX was visiting the convent. On the tour, in curiosity he drew back the curtain on the wall. Voilà! There was the painting of Pauline Perdrau, transformed and beautiful. “Mater Admirabilis!” the Pope exclaimed. “Why do you cover such a wonderful work?” This exclamation of the Pope, “ Mother Most Admirable!” became the title that she bears to this day. Word spread quickly of the beautiful fresco of Mater Admirabilis. A devotion took first root, and under this title, Our Lady began to grant favors and work miracles. The first miracle took place only one month later when Father Blampain, a missionary of the Congregation of the Holy Heart of Mary, was given the power of speech that he had completely lost. Indulgences were granted to the pilgrims who went in ever increasing numbers to pray there, and Pope Pius IX gave permission to offer the Holy Sacrifice of the Mass before the miraculous picture. So evolved the celebration of the Feast of Mater Admirabilis on October 20th to commemorate the Pope’s visit. It also became a custom of the Order to place a copy of the fresco in all the convent schools of the Religious of the Sacred Heart, so that Mater Admirabilis might inspire the young ladies studying there with her shining example. Now this struck me as a wonderful story for several reasons. At the time, I was principal of a fledgling Catholic girls’ school in Texas. Here was an image that could serve as a model ideal for young ladies, I thought. As a secondary point, the story offers great hope for those souls, like Pauline Perdrau, who have a healthy enthusiasm to realize projects for the glory of Our Lady, but lack the necessary skills to carry them out. If the work is undertaken in a completely disinterested spirit, Our Lady will see to its success, even if she has to work a miracle to do so. Now then, none of the unsuccessful paintings I have hidden away in a closet have ever been transformed, but Mater Admirabilis worked a different miracle for me. I returned home from that pilgrimage only to spend all of the summer flat on my back in my bed in my family home in Kansas. I had fallen from a horse before my trip to Rome. Travel and general fatigue had exacerbated the back injury, and the pain had become constant and debilitating, leaving me finally unable to lift my arm past my shoulder. At the end of August, I returned to Texas with the unpleasant prospect before me of telling the girls and their parents that I would be unable to continue teaching. Several days after my return, I unexpectedly encountered one of the ladies who had been on the Rome pilgrimage, the same lady who had insisted we climb those stairs to the Trinita dei Monti. She handed me a medal of Mater Admirabilis, and said, “Pray to her.” I did, almost mechanically: “Mater Admirabilis, help me.” I put the medal on and said the short prayer again before I went to bed. Nothing more. The next morning I woke up from my first sound night’s sleep in months and easily got out of bed. No pain. I lifted my arm. No pain. By the end of the day, I was carrying books to the classroom and preparing for the opening day as if I had never had a back problem. Mater Admirabilis had cured me – completely. I didn’t have the slightest doubt it was she. I also had a strong interior sense that she was trying to teach me something with this great kindness so unexpectedly shown to me. It is so very easy to become involved feverishly in a work, even a good work done for the greater glory of God. I had been working to the point of exhaustion to make the school a success – as if I personally could make it so. It is an illusion easy to fall into, especially for Americans, who gravitate toward concrete action as the solution to all problems. It is very simple to forget all but what is tangible and immediate, to lose touch with the supernatural, to put aside the life of prayer and contemplation that sustains every action. I understood that Our Lady had returned me in full health to a life of action, but she was asking me for more prayer and confidence, and less reliance on work and action. She was reminding me not to become nervous and distraught in face of the unexpected or should things not succeed. We have to do what we can, all that we can, then serenely and confidently leave the rest to God. Later, I was not surprised to learn that the grace which seems to be a special gift of Mater Admirabilis is an invitation to the interior life. There was another lesson I learned from the miracle Our Lady worked for me. It was to understand better the absolute goodness of our Heavenly Mother. She is a Queen in everything – including her goodness. Her goodness is a goodness beyond the imaginable, without a name. For her there is no obstacle. When she wants, when she is ready, she can free persons from any sickness, any vice, any impossible situation. I am sure many readers have experienced these small and great acts of kindness from Our Lady. At moments of trial and difficulty, it is good to remind ourselves of these past graces and gifts. Just as the miser pulls out his hidden chest of gold in the darkness and opens it to find consolation in his treasure, so Our Lady gives us each a chest of treasures – a special grace received here, an answer to a favor there, a miracle in an impossible situation. Reviewing these intangible gold nuggets revives our hope and gives us consolation, much more than what the miser receives from his coins. This help that Our Lady gives to individuals in personal situations also applies to the general picture. We are living in extremely bad times. A crisis shakes the whole Catholic Church as never before, a crisis for which sufficient adjectives are lacking. The only way to describe it is to say that the Church is in a process of self-destruction. Even in this sad situation we have to trust in Our Lady. She will come, as she has in the past, to re-conquer, to win, to restore. In face of such an apex of evil, we have to expect an apex of goodness, the goodness of Our Lady, Mater Admirabilis.